The term permanent hiatus refers to a television show or video game that work has been stopped on, often titles which find themselves on permanent hiatus are dangerously close to being cancelled. I've got some good news and I've got some bad news. First off the good news. I got an e-mail from Vanguard tonight. He is alive and well, and off enjoying other games online. Interpret this as you will. But it looks like PR is dead for now, but I would say that there may be a very slim chance of the possibility of something happening in the distant future. But don't get your hopes up. It's been quite a run... and I know I've had a lot of fun playing this mod. I've also enjoyed each and everyone of your guys's posts and ideas. That was perhaps the most fun of this site. Coming up with, and reading others, "Crazy ideas" for the mod. It's been an honor working on staff for PR for the relatively short time I've been here (compared to others). It's been fun... I will never forget you all... Thank you. Aww :(. I wish Vanguard good luck with everything. sigh. i thought this might happen, but i never guessed it would come to be. I bid the future possibilities of PR goodbye, but everyone, i wish to try to make new maps for PR, even though the mod is now dead. Try to check back here every so often, as i do not wish to lose the many friends i met here. I will try to get something else on the Revora forums, be it another mod i like, or otherwise. I hope VG will change his mind about this decision. GET PERMISSION TO DISTRIBUTE THE BETA?????? GET PERMISSION TO DISTRIBUTE THE BETA??????? Is the beta version gonna be released now Bob ? Or will it never see the light of day , because I am sure there are many of us that would like a copy . It could be like a final release to the public , as it has stuff that is not in 7.0, but I would not make the release version 8.0 I would make it 7.5 to show that it didn't quite make it to 8.0 . If you need Vanguard's permission please asks . I'll ask, but even if he says yes there really wasn't many new additions made to the very early stage 1 beta copy we were asked to test along time ago. 3. 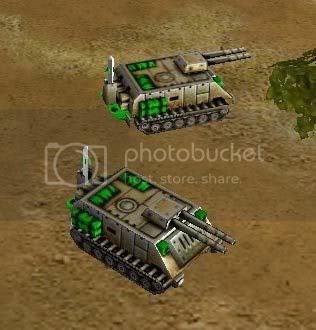 A lightweight T-60 tank for one of the GLA factions. I don't remember which faction had this, but no matter because it had a serious bug in it. It wouldn't build. That's it. The weather effects never made it to the beta. The Tech Exosuit factory wasn't in the beta. The expanded AF generals airfield wasn't in the beta. The new tech naval yard wasn't in the beta. The advanced Sigma AI died on the drawing table (so to speak) and never made it to beta. The GPS station was supposed to be removed from all U.S. factions and made into a tech structure for capture. That never happened. And I'm sure I'm missing other stuff that never made it to the early beta (more like alpha) release of PR 8.0. So, if anything does get released (as the beta stands now) don't look for any big changes other than what I mentioned above. If I were VG, I wouldn't release it as it stands now, because of all the problems. But that's not a call for me to make. So I will ask. Edited by Bob, 06 May 2007 - 07:10 AM. Remmember this post i posted in the ''Leave of absence'' thread? You will not see me leave this forum even when the PR is finished! I will stay here with anyone of you guys until this page if totally deleted, i die or till the end of the world! IF this forum is someday deleted it will bite off a big piece from me. I cant really describe my feelings for this place... if this happens im going to miss everything about it really much. Edited by Bismarck, 09 May 2007 - 01:44 PM. I feel the same way. This place is where I met many of my friends now (all of you are considered in that statement) and I will leave this as my homepage forever. We can still post ideas in crazy ideas, should VG decide to come back, and I can still make maps. I will truely miss this place without all of you, because you are what helped make the mod fun. Meeting people from all over the world, who all like one thing. That is why I think none of us should ever forget PR. Check back time to time, and if we can, try to extend it. If I knew enough about modding, I would take it up. But sadly, the only modding I know is Map.ini files, so i cannot help. If we could get another person who liked the mod a lot and knew how to mod, he/she could bring PR back to its former glory, before VG left. I would be gladly help in any way if you needed help with anything with the mod. Don't get me wrong I still play generals I just don't have time to work on the mod. I wont give up rights to it or anything that's in the mod. As for gen though it's dead. Hey Bob see the words that bolded would you have pic of the tank? Did ya ever get to drive thru the water? If it's any consolation, I didn't see it either. It wasn't in the earliest alpha version.